The most reliable and affordable solution for In-Ear Monitoring and Wireless Instrumentation. The Nady EO3 Wireless Personal In-Ear Monitor System with Earbud Headphones is packed with all the features you would expect from one of the most trusted and respected wireless brands on the market today. The Nady EO3 Wireless Personal In-Ear Monitor Systemis an all-in-one wireless audio monitor solution for direct, uncompromised referencing under the most demanding scenarios. Nady EO3 Wireless Personal In-Ear Monitor System provides high quality audio transmission up to 300-feet, extended battery-life up to 20 hours of use, and a virtually endless expansion of receivers; serving perfectly for live music performance, event/security communication relay, and various other musical or commercial multi-user listening applications. 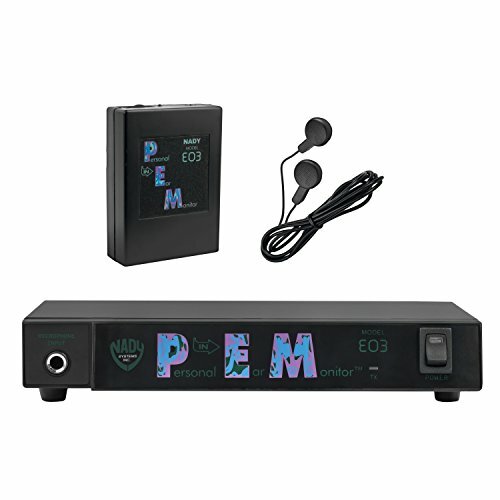 The Nady EO3 Wireless Personal In-Ear Monitor System includes a EO3-T Wireless Transmitter, EO3-R Wireless Receiver, and EB-3 in-ear monitor earbuds. Ultra-compact design with an operating range of 300-feet and up to 130dB for in-ear monitoring. Ideal for both small and large venues. Operates at an uninterrupted frequency range which provides stability and maximum compatibility with other close-range UHF/VHF wireless systems. Any number of EO3 receivers can be used with a single EO3-T transmitter. Serving perfectly for not only live music performance but also event coordination, staff direction, and security communication relay.